Pregnant? And want to keep up with your baby’s development, your symptoms and more? There’s an app for that! There are seriously apps for every walk of life. I’ve mentioned the best period tracker apps in a previous post that will help keep track of your menstrual cycles. 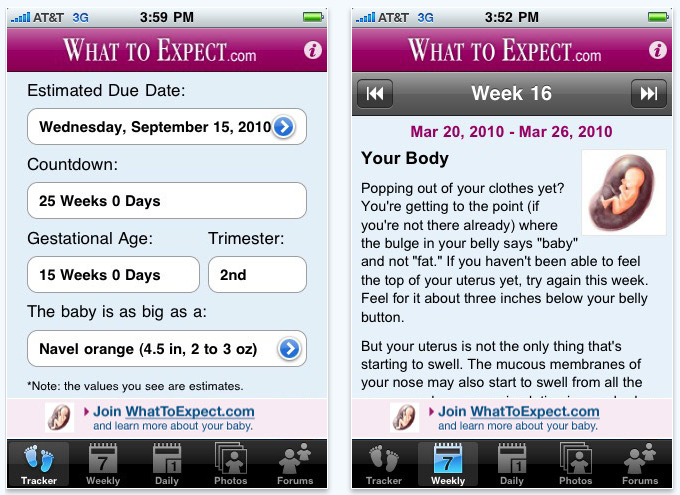 For pregnant women, you have a huge array of paid and free apps to download on your iPhone or iPod touch. I’m a penny pincher, so I’m an advocate of free apps. You can even find free versions of paid apps – these typically have limited features, but they’re still pretty awesome. 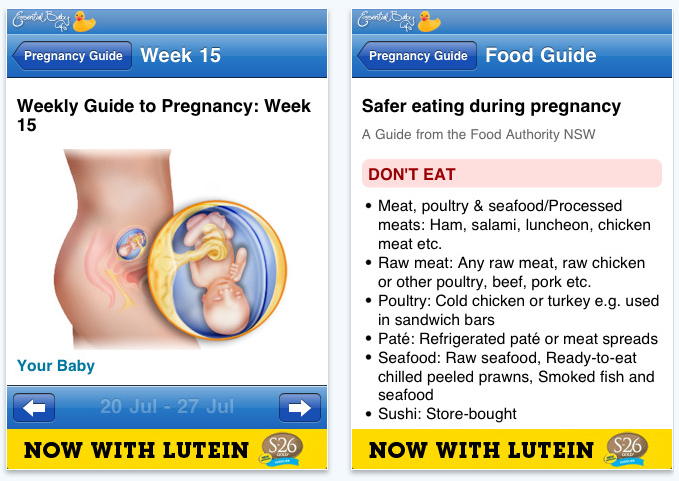 Free pregnancy apps are awesome and they are a wonderful way to keep track of your pregnancy. 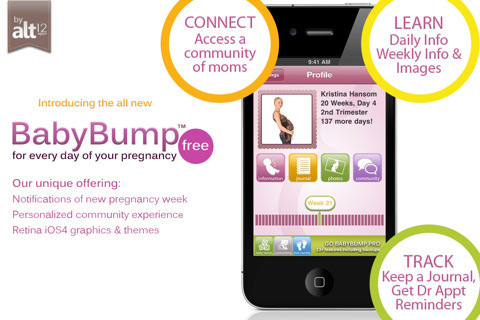 1.BabyBump Free is a nifty pregnancy app that makes it easy for you to keep track of your pregnancy. From the daily and weekly information and photos of your baby’s development to the personalized pregnancy countdown with a progress bar, you will absolutely love this free app. This free iPhone pregnancy app also gives you a list of common pregnancy symptoms, bodily changes, and food cravings that you should expect each week. You can keep track of your daily weight gain, symptoms, and more. 2. BabyCenter My Pregnancy Today is a free app from one of the most respected authorities on pregnancy. This app helps keep you up-to-date on your pregnancy day by day, how your body’s changing, fetal development (photos included), pregnancy checklist, free pregnancy videos, nutrition guide, and pregnancy progress tracker. You can get BabyCenter’s expert advice away from the computer and on the go. Pretty awesome! 3. 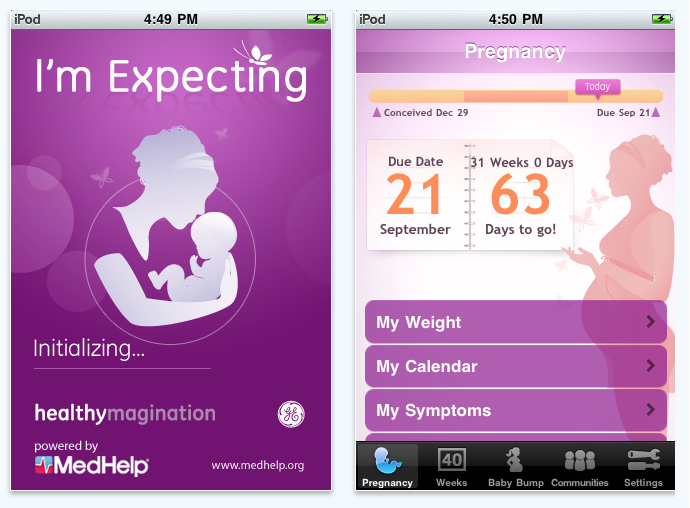 I’m Expecting – Pregnancy App is a must-have for any pregnant woman. This free pregnancy app lets you track your symptoms, your pregnancy weight gain, doctor’s appointments, and more. It gives you weekly updates on your baby’s growth and development, expert advice on how to alleviate common pregnancy symptoms, and information on what’s happening in your body week by week. You can even take photos of your growing tummy every week and create a slideshow. 4.Pregnancy Tracker from What to Expect is the perfect companion to the bestselling pregnancy book, What to Expect When You’re Expecting by Heidi Murkoff. 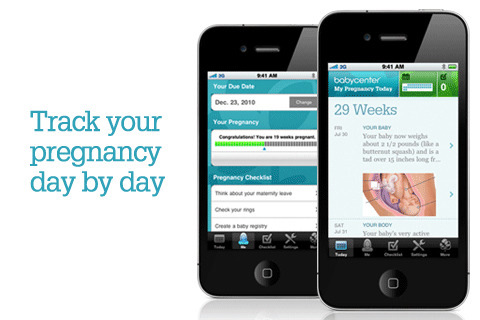 Keep track of pregnancy with this absolutely free pregnancy app! Available from the iTunes store, Pregnancy Tracker from What to Expect features a due date calculator, week by week details of your baby’s growth and development, illustrations of your baby’s development, updates on body changes to expect, countdown to your due date and more. 4. Fertility and Pregnancy Calculator is a useful app for both pregnant women and women trying to conceive. If you’re trying to get pregnant, this free app helps calculate your ovulation date and fertile days, and it even tells you when to make love to improve your chance at pregnancy. For pregnant women, it allows you to keep up-to-date on when important pregnancy tests should be done, and when pregnancy events occur. 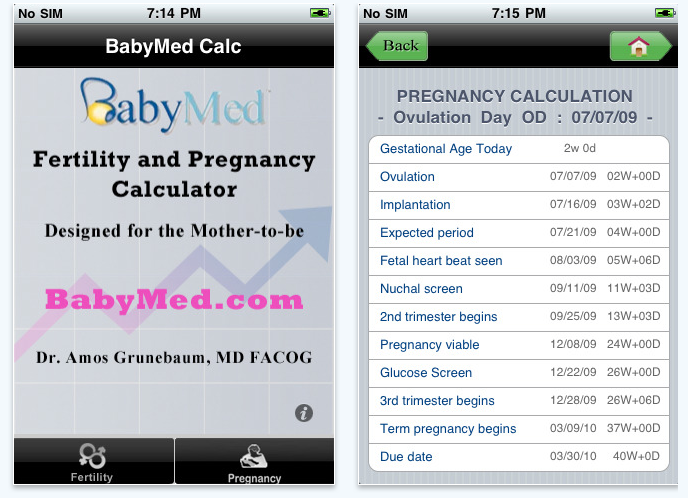 This free pregnancy app was developed by the OB/GYN Dr. Amos Grunebaum in collaboration with BabyMed.com. Check it out! 5. 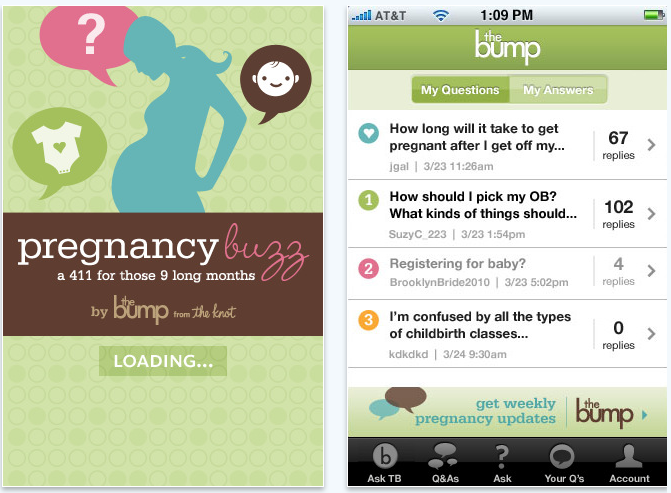 Pregnancy Buzz by the Bump is a very creative and cute pregnancy app that keeps expectant mamas informed at every stage of their pregnancy. This free app from the creators of TheBump.com gives you expert tips and advice on everything you might want to know – including what’s safe to eat (and what foods to avoid), what to expect at your prenatal visits, and almost anything you want to know. You can search questions from other concerned moms-to-be, and you can even ask your own pregnancy questions and get answers from the community. This is a nifty pregnancy app for pregnant women – well-designed and best of all, free. 6. Pregnancy and Baby Development by Modality, Inc. is a cool app that lets you follow your baby’s life from the day of conception through the first year of his or her life. 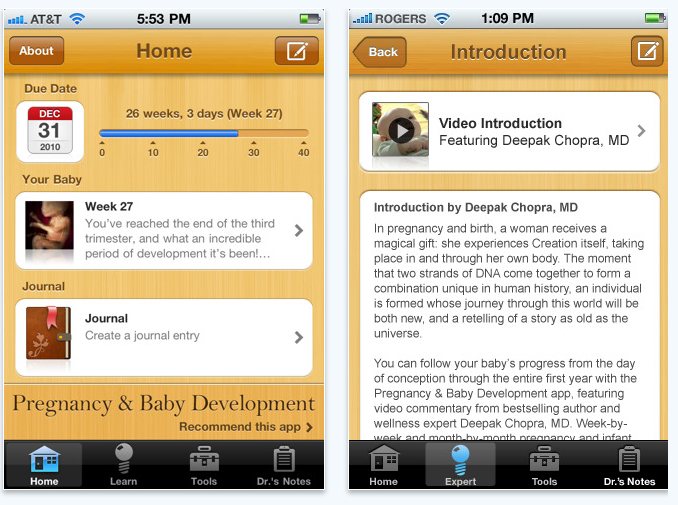 This pregnancy and baby app features high quality videos, commentary from a renowned doctor, Dr. Deepak Chopra, MD. You’ll also get access to helpful tools like a conception calendar, due date calculator, and a database of popular baby names. You can follow your baby’s week-by-week development inside the womb (with gorgeous images from the experts at TheVisualMD), and you’ll get a month-by-month infant development overview for the first year of life. 7. 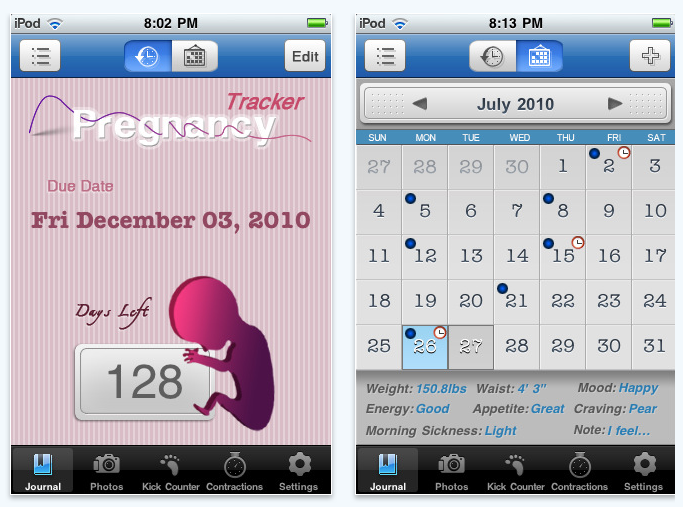 Pregnancy Tracker Free by Deltaworks is another free app for the iPhone or iPod touch that lets you keep track of your pregnancy. Using the date of your last menstrual period, you can automatically calculate your due date. You can also record your daily weight and waist measurements – so you can try to stay within the recommended weight gain fro your size. In addition, you can also keep track of your emotions and feelings and upcoming doctor’s appointments. This free pregnancy app also features a kick counter, so you can count kicks in the final trimester. When you start to have contractions, you can keep track of contractions by duration or interval and share this information with your doctor! It’s pretty awesome. 8. Weekly Guide to Pregnancy from Essential Baby is a useful tool that allows you to learn about your pregnancy week by week. You choose your due date, and you can track your baby’s development with diagrams of his or her growth and development. You’ll also learn about the pregnancy symptoms you’ll experience in each stage of pregnancy, and there is a safe food guide to help you plan your meals. Another feature of this free pregnancy app is the exercise guide for pregnant women. 9. 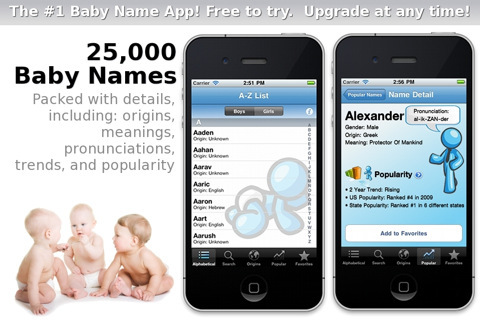 Baby Names by Schatzisoft isn’t exactly a pregnancy app, but it’s quite useful when you’re expecting. Coming up with baby names can be hard, and this app has over 25,000 boy and girl names for you to browse. The free version doesn’t give you the detailed information about each name (the paid version does), but it does let you browse the names by country of origin, popularity, and gender. 10. Pregnancy and Baby Care by Bounty gives you a portable guide to information about pregnancy, baby care, health and lifestyle, food and nutrition. You will get a ton of expert advice to help support you through pregnancy and taking care of a new baby. You will also get the latest pregnancy and baby news, tutorials, and other helpful info. If you’re pregnant and looking for awesome pregnancy and baby products, take a browse at Hip Chick’s Guide to Pregnancy and Baby Store – where I’ve handpicked my favorite products for women trying to conceive, moms-to-be, and baby essentials. Check it out. I will immediately seize your rss feed as I can’t in finding your email subscription hyperlink or newsletter service. Do you have any? Is it OK to share on Twitter? Keep up the superb work! question very quickly it will be famous, due to its feature contents. I’m still new to everything. Do you have any tips for inexperienced blog writers? I’d genuinely appreciate it. web hosting provider at a fair price? Thanks a lot, I appreciate it! 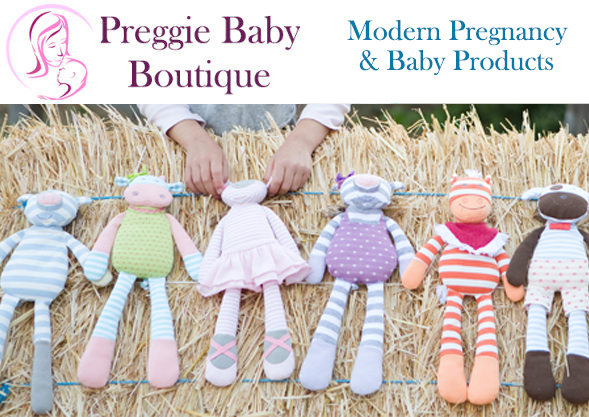 There are many pregnancy application available in the market but you should go with those who are suggested by Experts. RCGP’s recommended pregnancy website Emma’s Diary has a mobile app which you should go for, visit http://kodime.com/emma-s-diary-mobile-app. good content as you did, the net shall be a lot more helpful than ever before. to know if you knew of any community forums that cover the same topics discussed here? switch the light on for me as far as this specific topic goes. rest of the readers have to say.Nicely done. Hey very nice blog!! Man .. Excellent .. Wonderful .. I will bookmark your website and take the feeds additionally?I’m happy to find a lot of useful information here in the put up, we want develop more techniques in this regard, thanks for sharing. . . . . .
My wife wanted me to write her an app which monitors our babys sleep patterns while she’s pregnant so that we have half an idea of how little sleep we’re likely to get when we have her ! After using it for a few days it turns out that she sleeps during the day a lot, and is awake mostly throughout the night.. I really enjoy reading your blog and want to share this contest with you. You know, there are so many different pregnancy apps available for Android, Apple and other mobile devices. We want to hear your ideas and your readers’ suggestions! Tell us your idea for a pregnancy app that you would love to have! In 200 words or less, describe your pregnancy app idea for the chance to win $150 gift certificate for Amazon. You just put everything I've been thinking into words. I saw it again yesterday and I have plans to see it a 3rd time with my mother-in-law. After seeing it again, my 2 thoughts were: I want to read Breaking Dawn again and I kinda feel for Jacob in these movies. I love Edward too, but Jacob was very convincing.Gosh, I'm back in the nerdiness as well. Glad to see I'm not alone. Have you used watch me change pregnancy? 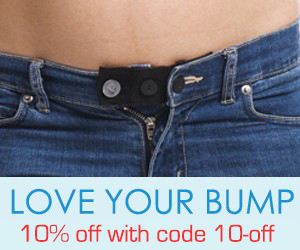 It’s pretty fun – it creates a time lapse video of your body changing. An amazing new app “My baby’s beat” was released just a few days ago – it allows pregnant woman to hear their baby’s heart beat, just like fetal monitor! The app is based on the iPhone microphone and requires no added hardware! There’s a new amazing App I’ve just downloaded. It’s Called My Baby’s Beat and it enables you to listen and record your fetus heartbeat. Just heard my baby boy. Exciting! I’m not having any more kids but I have a few friends who are. I’m passing it along!